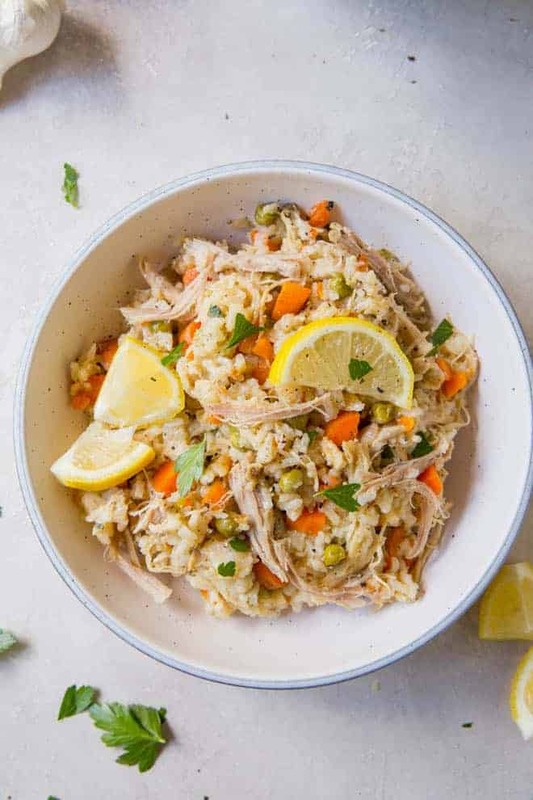 Instant pot chicken and rice is a healthy instant pot recipe made with hearty veggies, chicken and fresh lemon flavor. 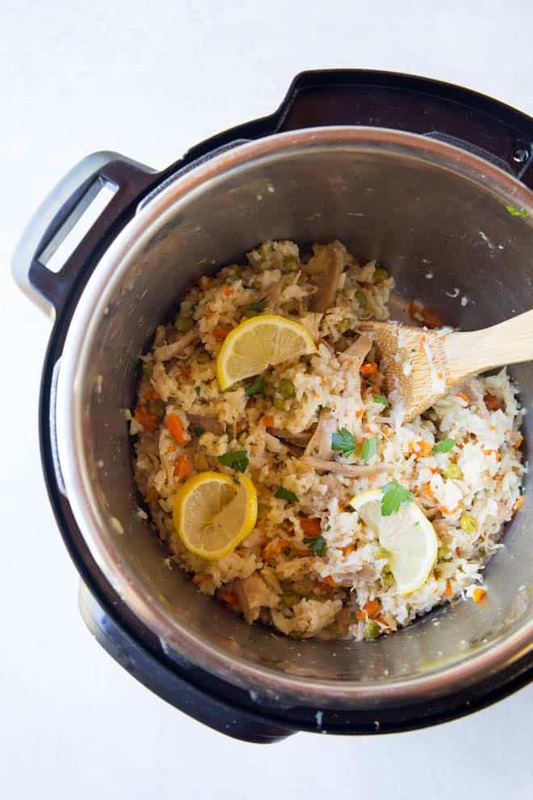 Make this easy pressure cooker chicken and rice recipe for dinner tonight or any day of the week. There are always go-to recipes that stay on rotation for family dinner. We love simple meals that require less than 30 minutes of our time so we don’t have to spend too much time in the kitchen. Meals using minimal ingredients or ingredients already stocked in our pantry and fridge are even better. 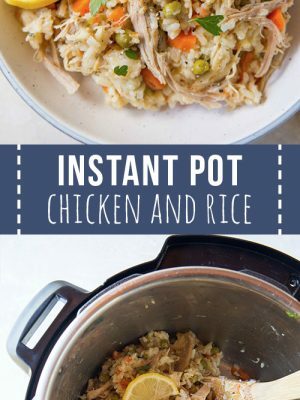 The Instant pot is one of our favorite kitchen tools because it makes dinner and clean up quick and easy. Plus, the pressure cook method ensures the ingredients cook evenly with the best flavor. 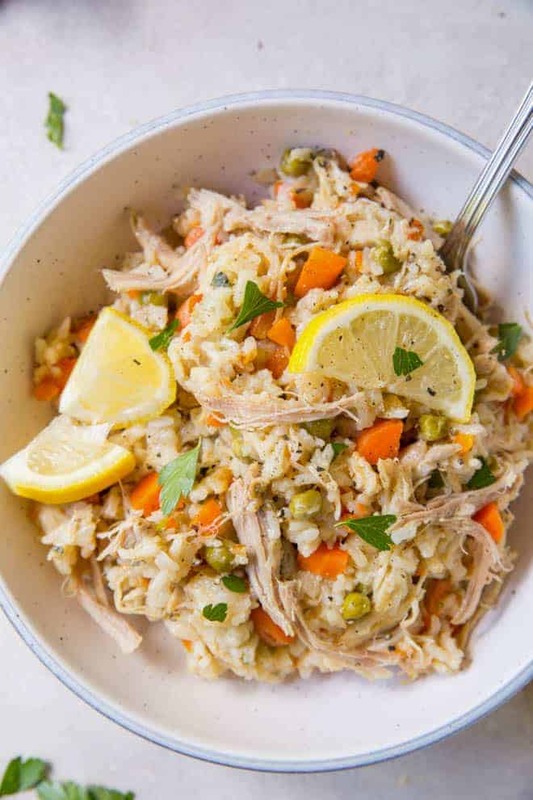 Instant pot chicken and rice is one of our favorite comforting recipes that the entire family loves. To make this pressure cooker chicken and rice recipe, season chicken breasts or thighs with salt and pepper. Press the Sauté button on the Instant pot. Heat the olive oil and then add the chicken, searing for 3 to 4 minutes on each side. Remove the chicken and set aside on a plate. Add a small amount of the chicken broth to the pot to deglaze, scraping the brown bits from the bottom. Then, add the onion and carrot and sauté for 3 minutes until softened, stirring often. Add the garlic and cook for an additional 30 to 60 seconds until fragrant. Press cancel on the Instant pot. Add the remaining chicken broth, lemon juice and zest, peas, rice and parsley, stirring to combine. Place the chicken breasts or thighs on top of everything, but do not stir. Close and seal the lid. Cook on Manual High pressure for 7 minutes before allowing a 10 minute Natural release. After the ten minutes, carefully release the remaining pressure. Remove the lid and shred the chicken with two forks. 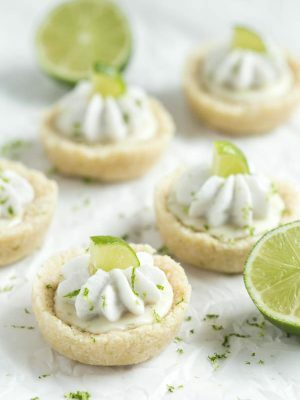 Mix together and serve with additional parsley and lemon wedges. 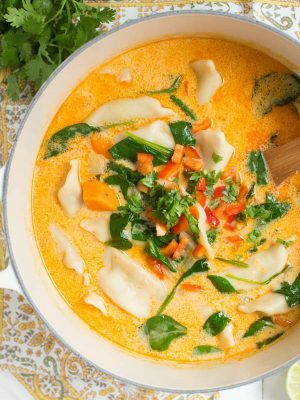 For this instant pot recipe, add the ingredients to the Instant pot as specified in the recipe to ensure that everything cooks all the way through. Once all the ingredients are in, you’ll cook on manual high pressure for seven minutes then allow the Instant Pot to release naturally (do not use the quick release lever at this point) for 10 minutes. In total, this recipe takes about 35 minutes to cook. How do you make chicken and rice on the stove? 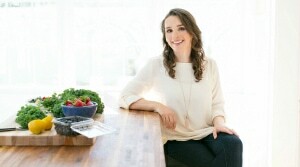 If you do not have an Instant Pot, don’t worry. 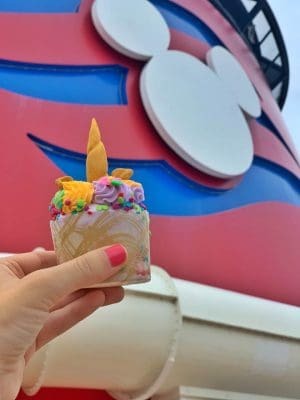 You can buy one to try it yourself (promise, you will love it!) or you can cook it on the stove. Heat oil in a 12 inch skillet on the stove, and cook the chicken until it’s browned and cooked through. Remove from skillet. Add chicken stock, seasonings and rice to pan and bring to a boil. Reduce heat to low. Stir in the vegetables and and mix until cooked through. Add chicken and voila! 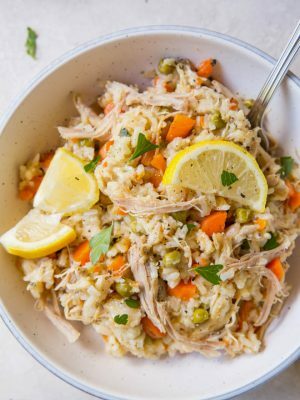 How do you make chicken and rice in a slow cooker? 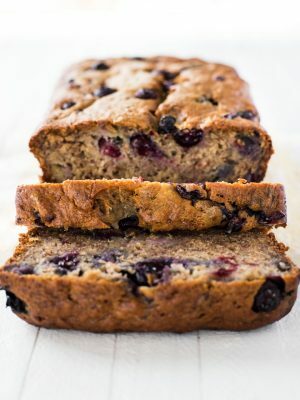 You can definitely make this recipe in a slow cooker. 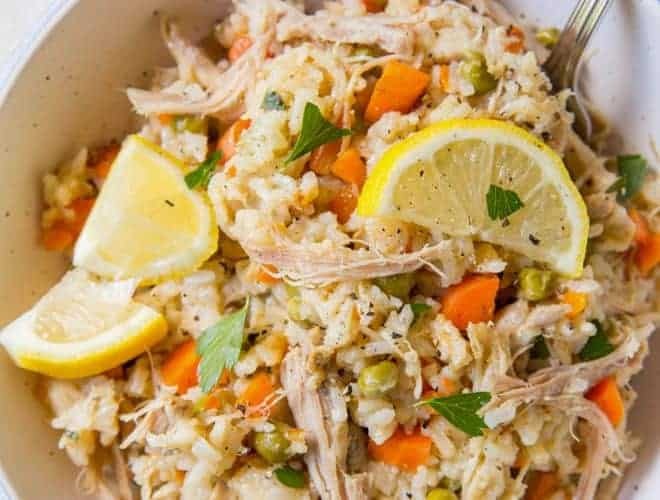 Spray the crockpot or slow cooker with non-stick spray, Add rice, carrots, onions, peas, garlic and seasonings to the slow cooker and stir together. Arrange chicken on top, and pour the broth or chicken stock over it. Stir to combine and cook on HIGH for 2 1/2 hours, or until the chicken is cooked through and the rice is done. 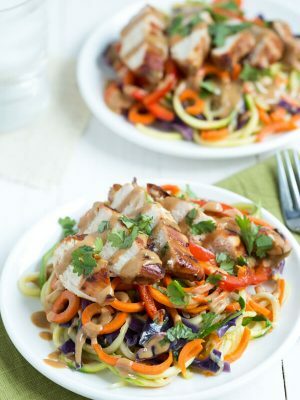 Shred cooked chicken and mix with other ingredients before serving. 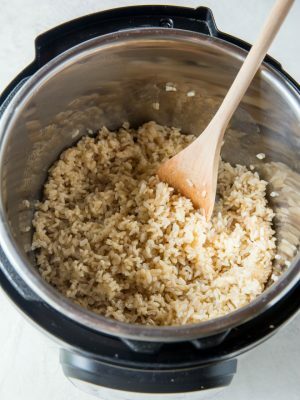 Use rinsed and drained white rice to prevent the rice from sticking to the bottom of the Instant pot. Make sure to scrap the bits off the bottom of the pan during the deglazing process. You can add more veggies and even include things like mushrooms or diced bell peppers. Instant Pot Turkey Sweet Potato Quinoa Chili is a healthier take on your favorite hearty chili. Lemon garlic butter chicken thighs are low carb and keto friendly! Serve them with garlic green beans or roasted broccoli and cauliflower with lemon and garlic. Instant Pot Beef Stew is a low carb recipe that is packed with flavor and wholesome ingredients. Instant Pot Salmon Dinner is a super quick dinner made with frozen salmon so you don’t even have to wait to thaw it! 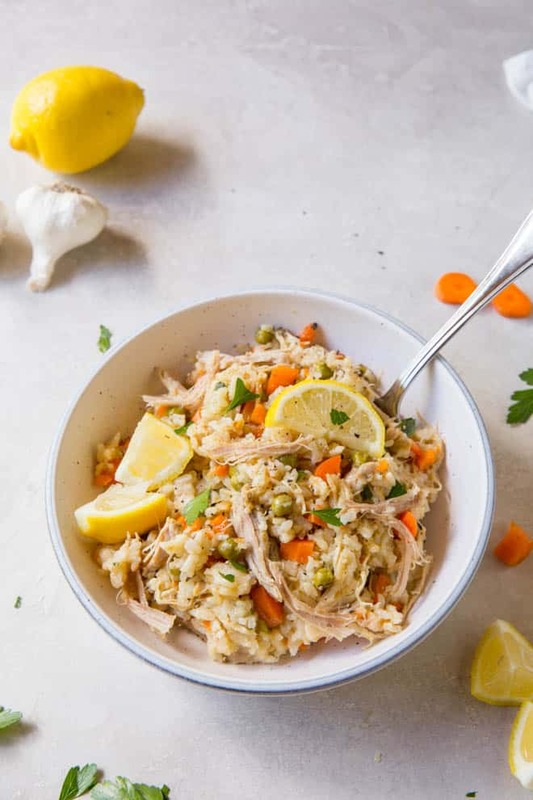 Instant pot chicken and rice is a healthy instant pot recipe made with hearty veggies, chicken and fresh lemon flavor. Generously season chicken with salt and pepper on both sides; set aside. Preheat Instant Pot by pressing the Sauté button. Heat olive oil, then sear chicken for 3 to 4 minutes on both sides. Remove and set aside on a plate. Deglaze pot with ¼ cup of chicken broth, scraping the brown bits from the bottom. Add onion, and carrot and sauté 2-3 minutes until softened, stirring often. Add garlic and cook an additional 30-60 seconds until fragrant. Press Cancel. Add remaining chicken stock, lemon juice and zest, peas, rice, and parsley, stirring well to combine. Place chicken thighs on top, but do not stir. Close and seal the lid. Cook on Manual High for 7 minutes, allowing a 10 minute Natural Release, then releasing the remaining pressure by flipping the valve. Remove the lid and shred the chicken with two forks. Mix everything together, then serve topped with additional parsley, a crack of black pepper, and lemon wedges. 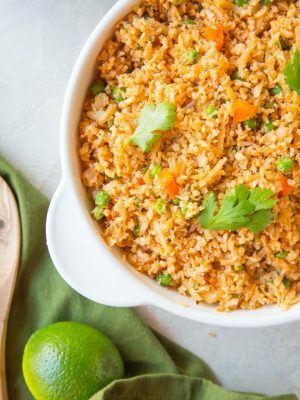 Use white rice that is rinsed and drain to prevent burning or sticking to the bottom. You can omit the lemon, if desired or add even more lemon flavor. You can substitute or add more vegetables, if desired. Mushrooms and diced bell pepper work great too. Store the leftovers in your fridge for up to 3 days. Reheat prior to serving.